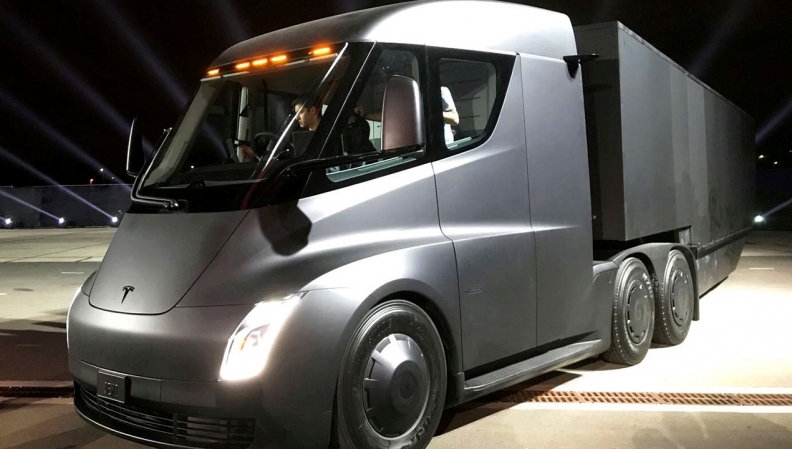 Toronto trucking firm Fortigo Freight joined Loblaw Companies and Walmart Canada in each pre-ordering Tesla semis, the $232,000 electric truck set to be delivered in 2019 that holds the promise of eventually becoming autonomous. MONTREAL — Once thought of as a distant fantasy, autonomous trucks are moving towards commercial reality on Canadian highways as companies look to boost productivity amid a driver shortage and governments seek to reduce deadly crashes. They are not yet driving themselves out of warehouses and down the highways, but companies of all sizes — including General Motors, Google and Uber — are testing out the technology. Already a banner year in self-driving advancements — including the first on-street test of an autonomous vehicle in Canada — interest in the sector picked up in the closing months of 2017 after Tesla Inc. showcased a fully electric semi-trailer truck equipped with semi-autonomous technology including enhanced autopilot, automated braking and lane departure warnings. Despite his company's investment, Fortigo president Elias Demangos isn't holding his breath for widespread adoption in the next decade. While the vehicles are ideally suited for corridors, such as Canada's busiest route between Montreal and Windsor, Ont., Demangos believes drivers will still be needed for short-haul services or to pick up and deliver goods. Estimates on how far away we are from a driverless future vary widely, but completely driverless trucks are already being used far from traffic, on remote resource properties. Suncor Energy is testing them at its oilsands operations in Alberta, while Rio Tinto is expanding their deployment at its iron ore mines in Australia. Rapid advances in technology are "revolutionizing" the way large-scale mining is undertaken around the globe, said Chris Salisbury, head of the mining giant's iron ore division. Transport Minister Marc Garneau travelled in October to Tesla's headquarters in Silicon Valley as part of his push to study safety and privacy issues associated with automated technologies to inform regulations his government plans to craft. He has asked a standing senate committee on transport and communications to study regulatory and technical issues related to the deployment of automated commercial vehicles, which have to potential to improve the safety, efficiency and environmental performance of Canada's transportation system. The committee is expected to deliver a full report in January. "There are significant policy, technical, and operational issues that will need to be addressed in the coming years before fully automated trucks are common on Canadian roads," said government spokeswoman Delphine Denis. The Canadian association representing the trucking industry — where autonomous technology could make the jobs of nearly 300,000 Canadians obsolete — recently urged the committee to avoid even referring to the technology as autonomous, much less driverless, preferring "advanced driver systems." The group acknowledges there is a long-term threat to trucking jobs that the recent census said is the leading employer of Canadian men, but insists that is unlikely to happen during the careers of existing drivers and may even help to attract young people to the profession. "The majority of Canadians are skeptical and rightfully so, of having 80,000 pound commercial vehicles driving without human intervention alongside the highway beside them," said Marco Beghetto, vice-president of communications for the Canadian Trucking Alliance. "The new modern high-tech truck will introduce many changes to our industry, but the constant will still be the driver, even if the role of the job evolves with the technology," he told senators. The International Transport Forum, an intergovernmental think-tank, however, estimated that more than half of the 6.4 million driver jobs needed globally in 2030 could become redundant if driverless trucks are deployed quickly. Automating the trucking industry will be more efficient because it will cut labour costs by 40 per cent trucks can operate for longer hours, said Paul Godsmark, chief technology officer at the Canadian Automated Vehicles Centre of Excellence. Godsmark said a similar transport revolution occurred a century ago when cars replaced horse and carriage. "When something better comes along we adjust pretty quick and if it only took 13 years to adjust 100 years ago, how much quicker will be adapt this time around?" Automation advocates argue that removing human drivers from the road will increase safety. Currently, about 10 per cent of all crashes the Ontario Provincial Police get called to involve a commercial vehicle. While driver error is typically responsible for about one-third of incidents, a spike this year pushed that up to 65 per cent, Ontario Provincial Police Sgt. Kerry Schmidt of the highway safety division said after a fiery crash killed three people on the Highway 400 north of Toronto in early November. However, confirming the efficacy of self-driving vehicles across many different driving conditions could be a challenge because autonomous systems don't respond the same way as human drivers. They react to patterns they've seen in the past and can't make the choice between avoiding a small child or wild animal crossing the road on their own. A group at the Massachusetts Institute of Technology is gathering human input into the type of ethical dilemma such machines will face. Participants are asked decide, for instance, whether a self-driving vehicle with brake failure should continue straight killing a woman, a baby, a criminal and a cat; or swerve, resulting in the death of a girl, a pregnant woman, a dog and a baby. While autonomous trucks will never be totally safe, such "live or die choices" are very rare, said Godsmark. Rapid advancements in self-driving technology will allow the system to react more quickly than the best human driver, he added. "The expectation is if we get all of that right there will be a lot fewer crashes."